Pink is best known for being a feminine, girly color, but what’s wrong with that? Who doesn’t love pink! Pink makes you feel bright and cheerful, and there’s nothing wrong with that! Everyone needs a bit of pink cheer in their life, so get started with a little pink necklace and accessorize your world in a fun, flirty and feminine way. You don’t need to go all-out pink, if you’re not quite feeling it, but a little dash of pink won’t hurt. A pink necklace will add color to your wardrobe and boost your heart with love and joy, so make sure you get that perfect piece that will lift your spirits and reflect your own personality. Here are just 10 pink necklaces you just have to check out, and we all know you’re going to want one of your own after you see them! If you’re looking to make a statement but want to keep it feminine and pretty, then this beautiful pale pink necklace could be just what you’ve been searching for. This gorgeous necklace will let you show off your personal style while keeping you right on trend. This pink necklace features an open design pattern with baby pink enamel on a yellow gold tone metal background with yellow gold tone outlining the enamel, to create a chic, modern look. The necklace features a yellow gold tone chain that measures just over 22 inches in length, making it a fashionable length for a wide range of clothing. This pretty pink necklace will look stunning with a lower cut top or open collar shirt. It will also look just as exquisite worn as a decorative collar over the top of a high neck top or turtle neck sweater, and even over a crisp, clean white button up shirt for an ultra elegant look. It would make an excellent gift for any fashionista who likes their style to look girly and graceful, and it even comes in a little drawstring gift pouch. This is the prettiest little pink necklace that will have everyone asking you where you got it. It’s modern, stylish and sparkly, and everything that a fabulous piece of jewelry should be. This stunning pink necklace features a gorgeous pink Swarovski crystal in the shape of a teardrop with a beautiful Swarovski crystal encrusted ribbon design over the top. The rose detail at the top of the pendant has a sparkling pink Swarovski crystal at its center, adding even more glitz and radiance to the necklace. The pendant is set in 18 carat rose gold plated metal, which gives the necklace a trendy look and helps to bring out the color in the crystals. The delicate rose gold chain measures just under 16 inches, letting the pendant sit quite high at your neck. This necklace would make a stylish gift for anyone who loves pink. The pendant is a nice size, at an inch long and just over half an inch wide, so it will catch everyone’s eye when you’re wearing it. So, you’re looking for a pink necklace with a little extra elegance. Well, it doesn’t get much more elegant than this beautiful pink pearl necklace. This feminine pink necklace will add a wealth of sophistication to your wardrobe and will give all of your outfits a touch of class, so you can attend any event, either formal or casual, with grace and style. 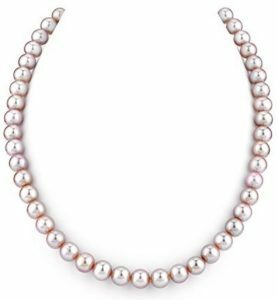 This necklace features 50 freshwater cultured pearls that are round in shape and between 7 and 8 millimeters in size. The pearls are a gorgeous natural shade of pink, which gives them an even more feminine look. This chic string of pearls is 18 inches long, which is known as a princess length, so you’ll feel like a member of royalty when you’re wearing them. The pearl clasp is 14 carat white gold, giving the pearls a classy and high quality look. Pearls can be worn for any occasion and, because of their natural origins, they look just as good with casual styles when you’re walking along the beach, as they do when you’re dressed up for a sophisticated soiree. This pretty necklace would make a great gift for anyone who likes to look polished and stylish and for anyone who loves a touch of pink in their life. Look at this darling little shoe! What a perfect little pink necklace for anyone who’s just had a baby girl, or who is about to be a new mother. This would be an ideal gift for a baby shower or to give as a present from the baby for a first Mother’s Day. This beautiful necklace features a shoe pendant in sterling silver, with pink enamel and encrusted with white diamonds. The diamonds add a little bit of bling and glamor to this dainty pink shoe pendant. The small size of the pendant makes it ideal for wearing everyday, as it’s discreet and delicate, so it can easily be worn to work, as well as out to lunch with the girls. The fine chain is sterling silver and measures 18 inches in length, so it will sit beautifully with most tops and dresses. The little shoe pendant is a fabulous little necklace that everyone will just love. For mothers of newborns, it will be a great way of always keeping their little ones close to their heart. Brighten up your day and add a little fun to your wardrobe with this fabulously fashionable pink Minnie Mouse necklace from Disney. 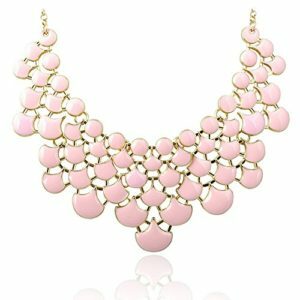 You will feel the spring in your step and the magic in your heart when you step out in this cute little pink necklace. This pretty necklace features a sterling silver Minnie Mouse pendant, that has been crafted and textured for extra detail, with a pink enamel polka dot bow for the top of Minnie’s head. The Rolo chain is sterling silver, measuring 20 inches in length, with a spring ring clasp closure. The chain and pendant are delicate enough for everyday wear, so you can show your love of Disney wherever you go. It’s a superb necklace for both adults and children, and with the long chain, kids will especially love that they are able to see it while they’re wearing it. It also comes in a specially designed Disney Fine Jewelry gift box, so even the box will get the kids (and some adults) excited! If you’re looking for an elegant pink necklace that will sparkle and shine, then this pretty necklace from Glamorousky is just what you need. This delicate looking necklace has an ultra feminine feel that would look exquisite at a formal event or a wedding. It would look stunning with a strapless couture wedding gown, where your flowers and theme contain shades of pink. 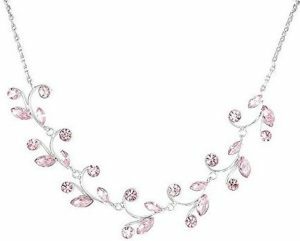 This sparkling necklace features dazzling Austrian Elements cubic zirconia crystals in a pale pink tone, with an arrangement of round crystals and leaf shaped crystals, to give the leaves and branch design effect. The crystals are set in a sterling silver plated pewter metal which blends into the sterling silver plated chain. The chain measures just under 16 inches and benefits from an extender chain tail, which gives you the option of adding an extra inch to the length. This pretty pink necklace would make a stylish gift for anyone who likes feminine designs and delicate accessories. It would be an elegant piece of jewelry to add a little sparkle to your brunch date and would go well with pastel or neutral colors. This is the perfect pink necklace to cheer you up and put a smile on your face. Everyone will comment on this happy looking cat when it’s sitting, looking pleased, on your neck. This cute little necklace has a metal cat pendant that is encrusted with clear Swarovski crystals. The cat is smiling and holding a larger pink Swarovski crystal, and he is said to bring good luck to all who wear the necklace, so not only do you get a sparkling and cute piece of bling, but you get an extra dose of good luck! The chain is a silver tone alloy and measures 18 inches, but also has a 2 inch extender tail so you can wear it as a 20 inch necklace if you prefer. The pendant is quite large, being just over an inch in length, so everyone will notice this little sparkler on your neck. This necklace would make an excellent gift for anyone who needs a bit of extra luck in their life and anyone who loves friendly cats. 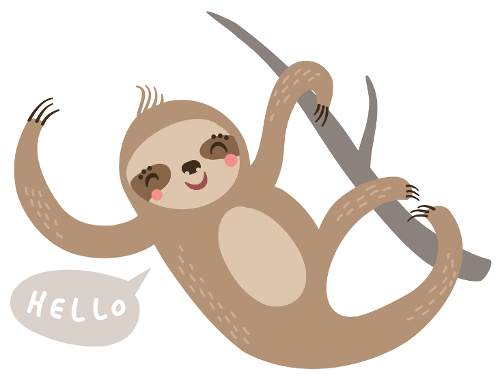 Kids and adults will all love this fun design, and it will definitely add some cheer to a dull day. If you’re searching for the perfect gift for your loved one, then this beautiful pink necklace from Katgi could be the one. It sparkles, it’s pink and there’s a heart. What more do you need to show someone you love them! 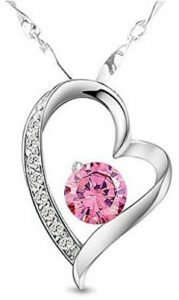 This stylish necklace features a polished white gold plated pendant crafted into the shape of a ribbon design heart with clear Austrian crystals on one side and a sparkling pink crystal in the center of the heart. The fine chain is white gold plated, giving it extra luminosity, and measures 18 inches in length, with a spring ring clasp closure to keep it securely on your neck. It would be a fantastic necklace for adding a little bit of color to your wardrobe, as well as a little bit of glitz. The necklace is chic enough for any occasion and you could even wear it to add a bit of bling to a casual outfit, so you’ll look glamorous no matter where you’re heading. Get ready for some compliments, because you’re going to get them when you step out wearing this pretty pink necklace. This is a fabulous statement necklace and is such a gorgeous color that it’s sure to brighten up your day, and everyone else’s! 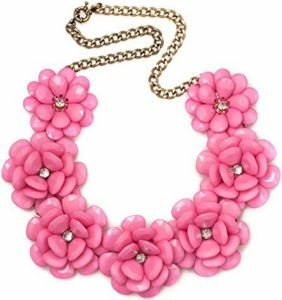 This bright pink necklace has a charming floral design that is eye catching and fun. There are seven large flowers, measuring around 2 inches, each with a little crystal in the center, to add a little glitz, and each one has large pink petals, which gives it its bold effect. The necklace will sit high on your neck for a bib collar effect and will go wonderfully over high neck tops, as well as looking fantastic with low cut tops and dresses. This is such a lovely necklace that would look adorably stylish at summer garden parties but also for casual strolls along the beach with a cute sundress. It would be ideal for adding a fun, feminine element to your outfits. This single pink pearl necklace offers the ultimate in delicate jewelry, for a refined look that can be worn everyday, wherever you go. This pink necklace will add class and elegance to all your outfits, so you look extra chic, even when you’re casual. This beautiful necklace features a stunning 8 millimeter pink freshwater cultured pearl pendant. The pink color highlights the pearl’s natural beauty and gives it a graceful and feminine appearance. The sterling silver chain is delicate and fine, to blend with the overall appearance of the necklace. The chain measures 17 inches and has a lobster claw clasp to keep it securely around your neck. This necklace has a brilliant versatility about it, as it can be worn with a multitude of outfits and will always look stylish. A pink pearl gives you instant elegance with minimum effort. Its natural beauty will be reflected in your own personal style, so you’ll always look good with it on! What more could you ask for!